Located on a 75-acre estate in upstate New York, against the backdrop of the Hudson River, Buttermilk Falls Inn & Spa evokes a sophisticated country charm, complete with an organic working farm and a full-service spa dedicated to sustainability. The Buttermilk Falls Spa features four treatment rooms, a green-friendly philosophy and water views; natural light permeates the 3,000-square-foot wellness facility, cascading in from oversized windows, reminiscent of the inn’s airy, uncomplicated beauty. An ideal, no-fuss escape just a little over an hour outside of Manhattan, this bed-and-breakfast-style inn in Hudson River Valley features historic artifacts, including bedrooms in the circa-1764 main building, a farm-to-table restaurant and plenty of secluded spots, from indoor fireplaces to outdoor flowering sculpture gardens, that invite guests to immerse in the peaceful surroundings. Tucked away on 70 acres dotted with expansive lawns, murmuring streams and flowing waterfalls, the 3,000-square-foot Buttermilk Falls Spa is a vision of calm and seclusion. The day spa has just four treatment rooms, capturing an intimate feel, offset by an eco-friendly, contemporary design detailed with geo-thermal and solar panels to heat the facility’s sauna, steam room and mineral-based current pool. Views of the Hudson River add to the tranquil vibe, and the integration of the outdoors provides a lovely contrast against the Zen-like interiors. The spa features a good number of treatments performed using organic-based, naturally crafted products like Babor, Fuji and Naturopathica. The spa’s signature staple is the Buttermilk Body Bliss, a luscious combination of an organic sugar scrub and coconut oil massage. An array of massage modalities are also on offer, including reflexology, deep-tissue, Swedish and shiatsu. 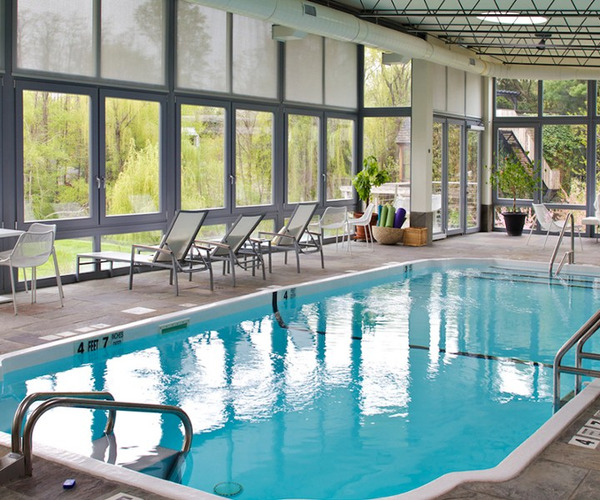 The easygoing, unpretentious atmosphere of the Buttermilk Falls Inn welcomes guests to come or go as they please, and relax or get energized at their desire. A 600-square-foot fitness center sports treadmills, an elliptical and a stationary bike, and there are two courts for tennis fans. Yoga is available twice a week, or visitors can exercise with leisure strolls through the grounds’ manicured gardens, orchard groves and nature trails that lead to exquisite findings like wildflower fields, a waterfall and ponds; just across the bridge suspended over the Swan Pond is Millstone Farm, where a visit to explore all its workings, the Aviary House (home to heritage-breed chickens and peacocks) and the Livestock Barn (with angora goats, llamas and alpacas) is a must. The charming ambience ensues even off property: The Hudson River Valley region is rich in art galleries, antique shops and wineries, and athletic endeavors include hiking the Rail Trail, boating on the river, golfing and fly fishing. The Buttermilk Falls Inn has 15 guest rooms, a majority of them in the historic main building, which was established in 1764; the remaining accommodations are housed in three attractive carriage rooms, two houses and one cottage. Uniquely designed interiors include built-in, working fireplaces and colorful artwork, and convenient fixtures like flat-screen TVs, air conditioning and whirlpool tubs/showers provide a touch of modernism. Far-reaching garden and river views relax and inspire, as does ample outdoor space. Complimentary WiFi is available throughout the property; all cottages and houses outside the main building also come equipped with full kitchens. 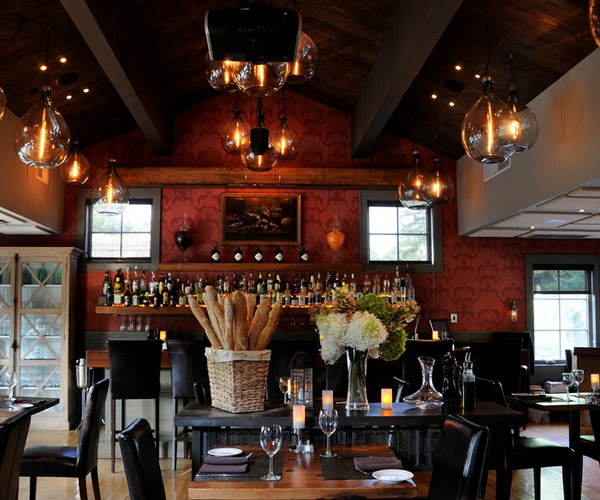 Food connoisseurs are in for an epicurean treat at the inn’s contemporary-meets-rustic Henry’s restaurant, which serves bountiful Hudson River Valley fare in a farm-to-table approach. An ever-changing daily menu includes dishes like buttermilk-battered, organic free-range chicken and coffee-rubbed Hudson Valley lamb, and the inn’s culinary team emphasizes resources that are handpicked or obtained from the on-site organic garden and local farms.